Wetlands of which importance has been begun to understand better day by day, are rapidly contaminated as results of population growth, irregular urbanization, industrialization and agricultural activities. The Lake of (Bird) Manyas of Balıkesir, which is one of the most important wetlands protected with Ramsar Convention and hosts Bird Paradise National Park in is under the high pollution risks because of increasing industrial activities in its surrounding. Furthermore, in consequence of the lack of knowledge on the current pollution levels of the lake and the impact of industries on the lake, the management plans prepared to lake protection cannot be all got in the act and not be executed in a seriously. For this reason, by determining the general state of the lake, taking of measures to minimize pollution and ensuring of sustainability of the ecosystem is of great importance. In this study, to determine pollution level of the Manyas Lake and sectoral effects on, in addition to conventional parameters, other pollution parameters determined by considering of the lake stress elements were examined. In the monitoring stage, from the previously determined sampling points of the lake and streams, water and sediment samples were taken by manual sampling method and analysed to determine the type, amount and change of contaminants. Results obtained from the monitoring studies carried out in last four years compared with Water Pollution Control Regulations (WPCR) of Turkey. It was concluded that the main pollution parameters of the lake were determined as Dissolved Oxigen (DO), Chemical Oxigen Demand (COD), Nitrate, Phosphate, Copper, Lead and Zinc. According to the specified pollutants, wastes from agricultural activities, mining activities, poultry farms and slaughterhouses mostly reach to the lake. It is concluded that these sectors are the major stress factors for the lake. Gürlük, “Manyas Gölü ve Kuş Cenneti’nin çevresel değerlemesi üzerine bir araştırma,” Phd. thesis, Uludağ Üniversitesi, Bursa, Türkiye, 2006. “Kuş (Manyas) Gölü Sulak alan Yönetim Planı 2011-2015,” Orman ve Su İşleri Bakanlığı, 2012. Dalkılıç, “Manyas (Kuş) Gölü Doğal Çevre Sorunları,” M. Eng. Thesis, Ankara Üniversitesi, Ankara, Türkiye, 2000. Sulak Alanlar Kitabı, Orman ve Su İşleri Bakanlığı, Doğa Koruma ve Milli Parklar Genel Müdürlüğü, ,Ankara, 2013. Hoşcan, “Tarımsal Kullanımlar Yönünden Kuş (Manyas) Gölü Su Kalitesi,” M. Eng. Thesis, Ankara Üniversitesi, Ankara, Türkiye, 1990. Standart Methods for Examination of Water and Wastewater, American Public Health Association (APHA), 17th ed, Washington, DC, 1992. Yüzeysel Su Kalitesi Yönetimi Yönetmeliği, Orman ve Su İşleri Bakanlığı,Sayı : 28483, Ankara,2012. ISNAD OZMETIN, Elif . "Determination of Priority Contamination Factors in Lake of Manyas (Bird Paradise)". 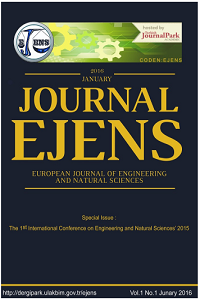 European Journal of Engineering and Natural Sciences 2 / 1 (February 2017): 87-94.